Solar Bobbleheads: these Sunshine Buddies relieve you from stress! Sunshine Buddies: happy solar Bobbleheads! 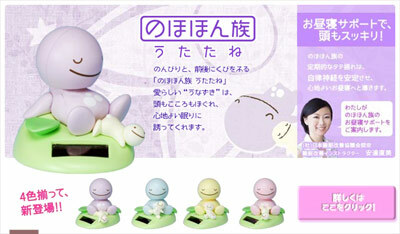 Solar bobbleheads: These solar powered desk knick-knacks are marketed as Nohohon in Japan and means ‘carefree family’ or ‘sunny people’. So what I can use it for? Looking at the same faces over and over, day in day out can be a little bit depressing. Ugly big nosed colleagues, miserable friends, annoying mother-in-laws, schoolmates… Life is just too short to waste your valuable time staring at unpleasant mugs. So how to brighten up your day? Simple, start staring at a face which always smiles, never has spots, a beard, long hair (in fact it’s bald…), doesn’t shout or spit at you or asks stupid questions! Nope, with the ‘Sunshine Buddy’ your days will always be the same, ehhh… I mean will always be sunny and happy and bobbly! Of course you need the sun to make it bobbly. has a head which nods silently from side to side. Forever. maybe the perfect gift to keep your running kid quiet. Or even hypnotize it. has its own facebook page! But what’s the point? 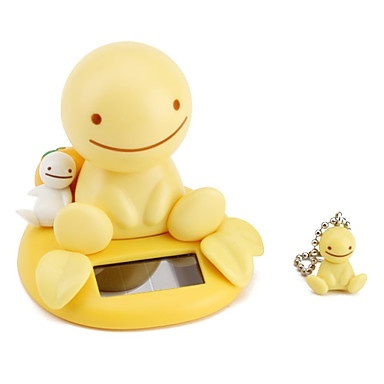 Well, according to the makers, a Sunshine Buddy can effectively calm your aura and relieve their owners from stress. Maybe it’s the nodding/swaying/moving head, maybe it’s the permant smile on his/her/its face, or is it the environmentally friendly edge? Want to know more and you’re able to read Japanese? Visit the official Nohohon Zoku Sunshine Buddy website. If your Sunshine Buddy is broken, clean the solar panel to see if it’s still providing electricity. If this fails, take a look here and follow instructions on how to repair solar stuff. You can buy solar Bobbleheads buddies at: Amazon or eBay.